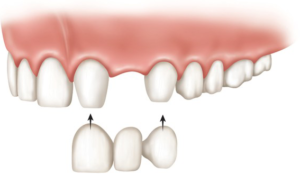 The bone where the tooth has been extracted will resorb over time, this resorption makes the adjacent teeth look longer as the gum pulls away. This also means that if you wanted a dental implant later on in life there may not be enough bone, or the procedure may be more uncomfortable or costly if bone grafting is required. The adjacent teeth on either side of the gap will have a tendency to fall into that space, potentially creating problems with your bite. The opposing teeth on the opposite jaw will have a tendency to over erupt and drift down into the gap, potentially creating problems with your bite again. On the subject of dentures to replace missing teeth, we recommend that when you clean them you always do this over a sink half filled with water. 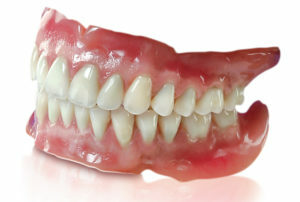 One of the most common causes of broken dentures is when people drop them into the sink whilst cleaning, if you half fill the sink then this is less likely to happen. Implants can last many years and so can often be the most cost-effective option over a period of time. Many patients around our London dentists have dental implants as they are considered an excellent solution to the problem of missing teeth. 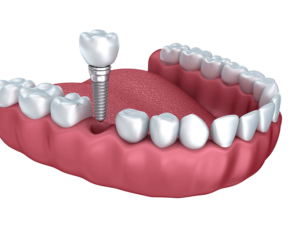 A dental implant is a titanium replacement for your natural tooth, with your mouth integrating completely with it you will find that, in most cases, a dental implant becomes an absolutely solid and permanent replacement for a missing tooth. The surgery for a dental implant is simple and for the most part pain-free. Any mild postoperative pain can normally be treated with over the counter painkillers. If you have missing teeth we would strongly urge you to consider dental implants as the preferred option for the reasons mentioned above. These are the final option that we offer from our dental practice in the heart of Euston, London. A dental bridge is made by gently reducing the teeth either side of the gap to accept a new Crown (or commonly called a ‘cap’). With a new crown on the teeth, either side of the gap we can suspend a new tooth and join it to these two new crowns, creating a dental bridge made of three components all joined together – the new Crown on either side and the false tooth suspended in the middle. to provide three new teeth, one for each side of space and the tooth to replace the missing one. This can have a cost implication which you may want to consider. Whenever possible we would encourage you to take action to replace your missing teeth in order to prevent possible future problems with bone-loss in that area and your bite. Only by having a full dental consultation will you be able to know for sure what your best option is, how it will impact you and what the likely costs of replacing missing teeth can be. Many dental practices in Wimbledon also offer easy payment options and finance plans, so it is worth checking these out before making a final decision over which dentist you are going to choose.